The Siberian Crane is today the rarest species of this family. 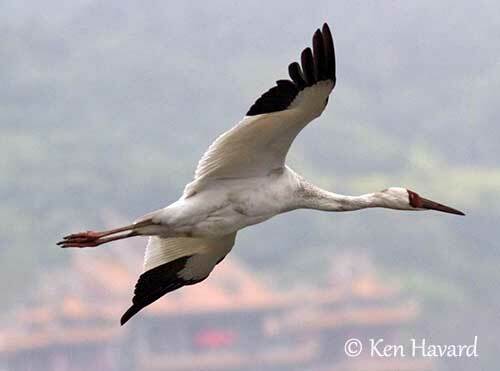 This white crane is threatened by degradation and habitat loss. In addition, they migrate over very long distances during which they are facing hunting pressure and crossing of the Himalayas. Considerable conservation efforts are active, but the main hope is to make safe the long migration corridor in W Asia, with help of the crossed countries. The adult has white plumage overall, except for the black primaries only visible in flight and during displays. On the head, the bare skin of forehead, face and head sides is dark red, forming a kind of mask from the bill to behind the eyes. The long bill is blackish and dark red. The eyes are pale yellow. Legs and feet are reddish-pink. Both sexes are similar, but the male is slightly larger and the female has usually shorter bill. The juvenile has feathered face, buff to cinnamon plumage and paler bill. It is sexually mature at three years. The Siberian Crane has three distinct populations. The eastern population is the largest and breeds in NE Siberia and winters to the Yangtze River in China. The central population breeds in W Siberia and winters in Rajasthan in India, in Keoladeo (Bharatpur), and in other Indian wetlands. The western population is the smallest with ten birds. It breeds in NW Russia and winters in S coast of Caspian Sea in Iran. All perform very long-distance migration, between 5000 and 6000 kilometres, during which they have to cross the Himalayas and suffer hunting pressure. 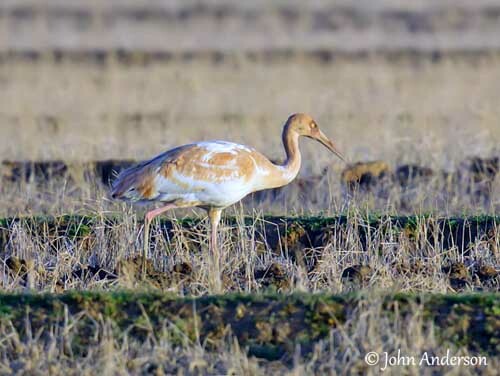 The Siberian Crane is omnivorous, but with more varied diet during summer, including roots, rhizomes, seeds, sprouts of sedges and other plant items. It also consumes insects, fish, rodents and small animals. During the migrations and in winter, it feeds primarily on plant materials and some aquatic animals if available. This cranes forages by wading in shallow water, and digging in wet soils. During the breeding season, the Siberian Crane performs courtship displays similar to those of other Gruidae. Like other cranes, mated pairs engage in unison calls consisting of series of coordinated calls. The birds stand with head thrown back and bill pointed skywards. The male raises the wings over its back during these calls, whereas the female keeps them folded at her sides. Displays are initiated by the male. Both mates call in unison, and engage in dancing, including bowing, jumping, running, stick or plant tossing and wing flapping. Like in other cranes, this behaviour is used both in courtship and in social behaviour and to strengthen the pair-bonds. 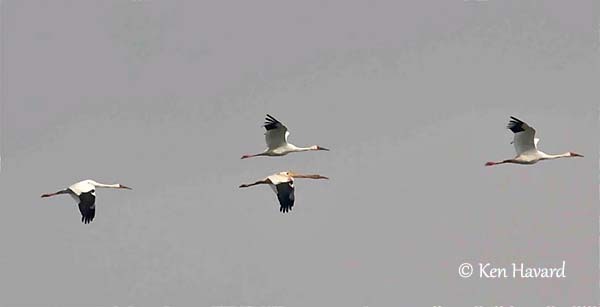 The Siberian Crane is a great flier, able to travel long distance on powerful flight. It tries to use thermal soaring as often as possible. The black pigment in the primaries strengthens the feather’s structure, which is very helpful over long distance flight during migrations. 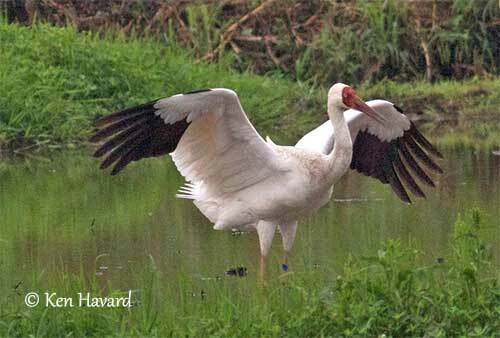 The Siberian Crane breeds during the spring, but the laying may vary according to weather conditions. This species nests in varied wetland types. The nest is a flat mound of vegetation, often sedges and grass. This structure is elevated about 12-15 centimetres above water-level. The female lays two eggs from late May to mid-June. Both sexes share the incubation during 29-30 days. The chicks are yellowish to cinnamon. They fledge about 70-75 days after hatching. They are aggressive against each other, and a high rate of post-hatching mortality is usually reported. The Siberian Crane is classified as Critically Endangered. There are only three populations in restricted range. This crane is threatened by degradation and habitat loss in its wintering areas, stopover sites and breeding grounds. Drainage of wetlands, agriculture expansion, oil extraction and human developments are important threats. Hunting pressure during migration in Pakistan and Afghanistan affect the migrating birds too. Populations are very small and need protection measures for conservation of the habitat. Captive breeding is active, and a number of releases have occurred yet. Other measures are in progress in order to help in the recovering of this species. 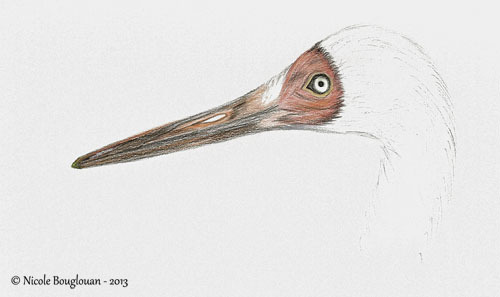 The Siberian Crane is more aquatic than other Gruidae species. It breeds, feeds and roosts in wetlands, including tidal flats, bogs, marshes and widely open wetland depressions in lowland tundra, and in the area where tundra and taiga are joining. During migrations, stopovers occur in isolated wetlands. The wintering grounds are similar, consisting of shallows and mudflats of seasonal lakes of Yangtze Basin, whereas in Iran and India, they frequent artificial dams and flooded ricefields. 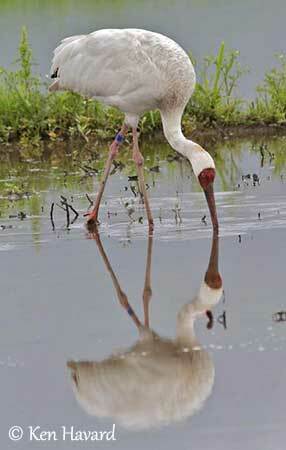 The Siberian Crane utters more musical sounds than the other cranes, usually flute-like calls.